Budding musicians who want to learn to play bass guitar are perplexed over which is the best. How many strings and which style of body and neck should you opt for? Which will suit the style of playing you wish to adopt? These questions and many more are covered in my own personal look at which attributes suit me best and which might suit different playing styles. This article will naturally be biased toward my own personal playing manner, but I think that if you can just play the instrument in its most basic form first, you can then branch out to create your own personal style. How Many Strings Should a Bass Guitar Have? A visit to a musical instrument store that specialises in basses will have a lot of different models on show, with four, five or even six strings and a variety of different body shapes and necks. By far the most common type of bass will have four strings tuned to the standard lowest four of a regular guitar, i.e. This is the configuration that I play and prefer for a whole lot of reasons that I'll explain here. 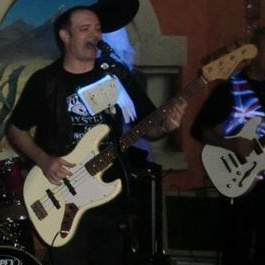 My instrument and constant companion on all my live gigs is a Fender Jazz bass from the late 1980s that was made in Japan. Having just four strings meant the neck was narrow enough for me to play it in comfort and since I was in a 3 piece band (drums, guitar and bass) my playing required a lot of fast note changes and runs with some two or three note chords it was perfect. Playing different styles such as soul; blues; ska; New Wave and rock all seemed to work really well with this instrument. Going up to five strings gives you more scope for playing a low B or low C beneath the E and is good for some slow rock (such as Pink Floyd - listen to the live version of "Comfortably Numb") and where you want to accent the low end. You have to remember that to accommodate the extra string, the neck has to be wider, which will make it more difficult to play although some see that as a challenge and indeed some bassists have met that challenge and excelled. Six string basses are used more in jazz styles where a lot of "walking" needs to be done up and down the fret board. Again, the neck and fret board needs to be very wide to cope with all those strings and that will make playing more difficult. Certainly one for the virtuoso, although you have to remember that most people in the audience won't be taking any notice of you since non-musicians (the vast majority) are more interested in hearing a great song played and sung really well. I've tried five and six string basses but still prefer the four string configuration for most styles I play. I think some of it will come down to personal preference and maybe a little posturing and posing on-stage because a six string bass will get some attention from other musicians (but to my way of thinking, that's the worst reason to choose an instrument). What Type of Neck is Best? The shape, width, profile and thickness of the neck of a bass guitar are all important factors that can influence your playing style and will need to be chosen carefully to suit the one you want to pursue. Again, it will come down to personal preference so I can really only advise from my own point of view. I prefer a fairly slim neck with a fairly flat profile, which is a common trait of "jazz" style basses. For me (and I don't have large hands, sort of slightly bigger than average I guess), it means I can play at some speed for long periods without my left hand getting tired. Now for someone with large hands, a fatter, wider neck would be better especially if those fingers are fatter too. A wider neck means the string spacing is also wider and you can avoid inadvertently catching the next string up or down when you're playing. For 5 and 6 stringed instruments, a wider neck is a given, although I remember trying a Yamaha 5-string that had an unusually narrow neck and it felt just fine for me, although most of the guys in the store said they hated it. It almost sold me on getting a 5-string as a backup instrument for on-stage, but I resisted! For someone with small hands, playing most basses can be quite a challenge. I'd say go for a slim neck and maybe lighter gauge strings unless you have a lot of strength in them. What String Gauge is Best? 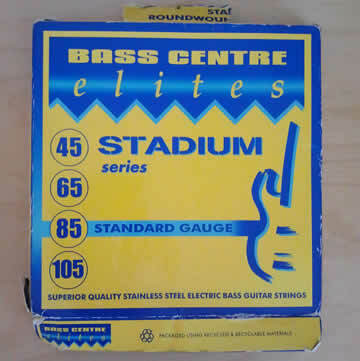 There are several standard gauges of string sets for bass guitar ranging from 30-50-70-90 up to 50-70-90-110 for four string instruments. I personally prefer 45-65-85-105 which are pretty heavy gauge but have a good tone and lots of bottom end which suits my playing style and the kinds of music I play. I won't go into 5 and 6 stringed basses here as you can pretty well figure it out by adding the heaviest gauge string you can find for the lowest and a light gauge for the highest. Since I play different styles from straight finger style to heavier thumping right up to slap and even some pick playing (when I need a harder edge and toppy sound), the gauge set I choose seems to be the best all-rounder for me. Another consideration is whether to go for the most popular roundwound (as I do) or flatwound as favoured by fretless players and also reggae and some blues players. Roundwound strings are brighter (the brighter the better for me), while flatwound have a thicker sound and they're also smoother on your fingers. You can get electric bass guitars with fretted and fretless necks and which you choose will again come down to your personal style of playing. Most bassists play fretted and this is also my choice as they suit most styles and give you more control, especially with note accuracy. Fretless basses are best suited to they kind of playing that requires some sliding of notes, with one of the best popular examples being the Eagles, "New York Minute" because that bass sound is just so atmospheric and totally cool! Incidentally, flatwound strings will be the best choice for a fretless bass because they produce that slightly acoustic feeling, smoother sound that really lends itself to those sliding notes. 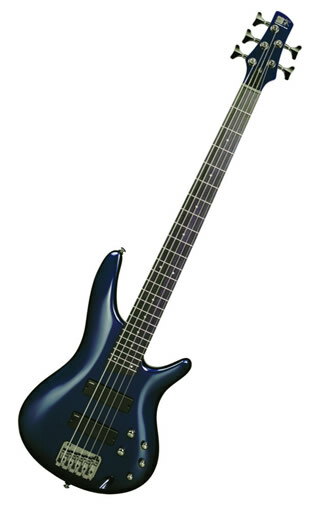 When I bought it in the UK, I tried several different models, a few Jazz basses that were more expensive and made in the US plus a lot of different popular brands such as Yamaha, Washburn, Warwick etc, but this one, which was actually one of the cheaper models at the time (you try and buy one now!) just felt great in my hands. It played nice and smoothly and I just liked the feel of it. I think most musicians will choose their instrument based on how it feels more than what the name on the headstock says or where it was made. If it feels and plays well and you get that "comfort" feeling inside that speaks to you and says, "This is the one," then you have to go with it. Some 30 or so years on, I still play that same instrument at all my live gigs, so my choice was certainly vindicated. I think if you have an instrument that you're comfortable with and it has become a part of you and your playing style, then you don't need anything else! Which Brand of Bass is Best? Now that's a question that really is subjective. It's like asking someone which make of car they should go and buy. A Mercedes lover will always say "Get a Merc," while a BMW lover will say "Don't buy a Merc, get a Beamer!" Incidentally, I used to drive am old British made Jaguar, so there! Anyway, as to the brand of instrument, there is no "best" since most of the top makes have their own features that will appeal to different players. As I already said, I chose the Fender on its feel and how it played in my hands. Another player may have put that one down in favour of a Warwick and it would have been the right choice for them. What I'm saying is don't always just look at the expensive brands and think they must be the best because they cost the most. Not always true! I remember trying an amazing looking Steinberger at the Bass Centre in London back in the 1980s that was one of the most expensive instruments they had in the store. After a few minutes I put it down, deciding I didn't like it because to me it felt cold and uncomfortable! I picked up a cheap Yamaha model and it immediately felt warmer and just nicer to play. The only way you're going to know for sure which is the best bass for you personally is to go visit a store and try some. The one that feels right will be the right one for you!